Happy Leap Day 2016! We at the GoLaw Legal Network hope you will “Be Our Valentine” all year long by joining us on our Online Social Networks. Last month we posted Part One of an article about Car Safety Recalls from Farmers Insurance, and a few tips on What to Do If Your Car Is Hit With A Recall – Part One. This month, GoPersonalInjury.com brings you more Auto Safety Tips and Best Practices with “Car Safety Recalls Part 2: Toyota”. – Toyota Driver Side Seat Track Assembly: In the seat rail of the driver seat of the subject vehicles, the springs used for the mechanism which locks the seat rail in its adjusting positions could break. This can happen if the seat is adjusted forward and/or rearward with high frequency. If a seat rail spring breaks, the seat may not lock into the adjusted position. If the vehicle is operated with a broken seat real spring, the seat could move in the event of a crash, increasing the risk of injury to the occupant. – Toyota Steering Column Spiral Cable Assembly: The steering column assembly in the involved vehicles contains a spiral cable assembly with electrical connections to the driver’s airbag module that could become damaged when the steering wheel is turned. If this occurs, the air bag warning lamp will illuminate. In addition, the driver’s air bag could be come deactivated, causing it to not deploy in the event of a crash. This could increase the risk of injury to the driver in certain types of crashes. Animal attacks can cause serious life threatening injuries. At GoLaw.com we have been helping people like you recover for medical bills, wage loss, plastic surgery and pain & suffering since 1980. Thanks to GoPersonalInjury.com for finding this weekend’s safety article by CNN and the NY Daily News who reported the story of a New York Man Attacked by Dogs. The gruesome attack Friday was captured on video from the window of a tenement in the Bronx. The pit bulls are seen clamping onto Bove’s arms with their jaws, shaking their heads violently, dragging him several feet toward the curb. 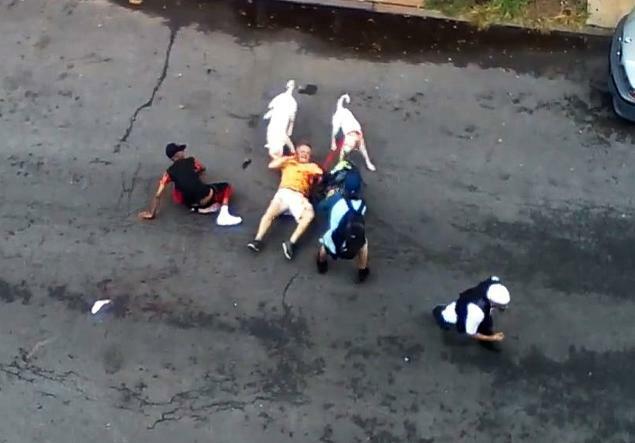 Good Samaritans try to stop the assault — swinging a chain at the animals, spraying them with water. They attempt to encircle Bove, but the dogs swerve around to continue the attack. Still, the people probably helped save Bove’s life. “I got to the hospital and he was in pieces,” Bove’s son, Anthony Bove, said, describing gaping holes in his arms, a severed ear and the other split in half, and lacerations all over his body. The horror began when the dogs’ owner, Cynthia Oliver, 55, exchanged words with the victim, said NYPD spokeswoman Detective Annette Markowski. Oliver was holding the pit bulls and dropped the leash, she said. The dogs attacked. But Anthony Bove said his father told him there was no altercation, no words exchanged. Francesco Bove was walking to Our Lady of Mount Carmel Church when one of the dogs pounced, followed by the other, according to the son. Oliver was taken to a hospital for a psychological evaluation before she was arrested on eight counts of assault and two counts of reckless endangerment, Markowski said. It’s unclear whether she has an attorney. In the video, another man steps in to help after Bove is knocked to the ground. The man uses his hands and legs, trying to keep the dogs at bay, but the animals find their way back to Bove. The good Samaritan is knocked down. Screams are heard. “Let him go!” someone yells. At least eight people on the street try to help as the pit pulls drag Bove away from the small crowd. One man is seen firing a stream of water at the dogs with a hose. Bove lies in a pool of blood. Two pitbulls attack a man in the Bronx as a bystander tries to pull them off using their leashes. Graphic cellphone video shows the dogs relentlessly lunging at Bove as he writhed on the ground in the middle of the street. Good Samaritan Emilio Ortiz, 46, tried to help, but the dogs kept at it and dragged Bove to the curb, their teeth clamped on his arms. Police said Bove and the first man who jumped in to help — an unidentified 46-year-old male — were taken to St. Barnabas Hospital. The younger man, who suffered lacerations on his arms, was later released, according to Anthony Bove. Francesco Bove, an artist and restoration expert from Brooklyn, is in stable condition after undergoing surgery, according to his son. His severed ear was reconstructed. He will have another operation on Monday. 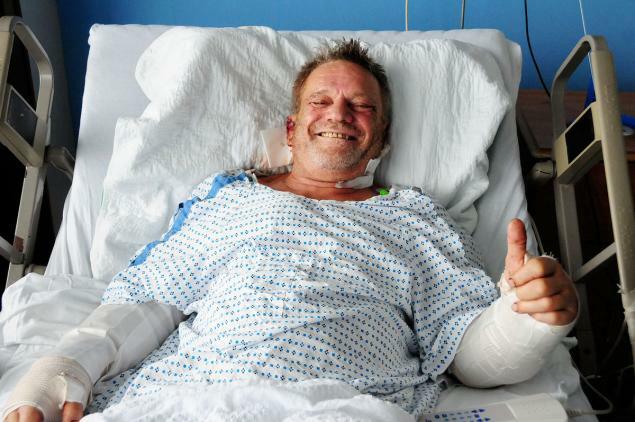 Bove has stayed positive and joked to his son that at least he hadn’t been attacked by a lion. The elder Bove suffered nerve damage in his hands and hasn’t been able to move his fingers, according to the son. The pit bulls are now in custody of animal control authorities, Markowski said. That worries the Boves, who own a pit bull named Gina as well as five cats. “My father feels terrible that the dogs are probably going to be put to sleep,” Anthony Bove said. “The pit bull is not an inherently evil dog. But … these pit bulls might have been trained as guard or attack dogs. He remembers the dogs licking his blood off the ground. They wanted to finish the job. That’s very disturbing to him.” CNN quoted. Meanwhile, Bove underwent five hours of surgery Friday night and is expected to stay in the hospital at least a week to undergo another surgery to move a nerve from his leg into his arm, his son said. Bove… even showed some compassion for Oliver, who has been arrested 37 times since 1987, mostly on drug offenses. “She was a petite, weak lady. (The dogs) were dragging her wherever they go and she couldn’t hold onto (the leash),” he said. The two pit bulls were taken to a city Animal Care and Control facility, and may have to be euthanized, officials said. They may have treated him like a chew toy, but Bove is worried about the fate of his attackers. “I’m so sorry that they’re going to put them down,” Bove said. WATCH THE SECOND VIDEO HERE. #VIDEO: Listen to real-life stories of Motorcycle vs Car Accidents on Highway 99 and hear actual CHP 911 Emergency Calls in “Motorcycle Safety – Thrill? Or Buzz Kill?” an Informational Video by the California Highway Patrol YouTube Channel. “Motorcyclists need to be aware of the added danger they’re in every day. The California Highway Patrol promotes safe motorcycle riding. This video contains graphic views of the results of some motorcycle collisions. It’s goal is to warn motorcyclists of the dangers that exist on the road. If you’re a motorcycle rider, you owe it to yourself to be careful. Thanks to http://GoMotorcycleCrash.com for a dramatic and heroic True Story of a group of Good Samaritans who helped rescue a Southern California Motorcyclist that was trapped under a moving Truck on the 1st day of this Motorcycle Safety Awareness Month. As reported by #ABC7Eyewitness and CBS Los Angeles: a Motorcyclist was hit by a car while changing lanes on the eastbound 91 freeway, just west of the 71 in Corona, CA. Another driver, who thought he saw a bumper being drug beneath the vehicle, flagged down the truck driver so they could rescue the motorcyclist. Fortunately, the driver of the motorcycle received only minor injuries because he was wearing protective clothing and a quality helmet. 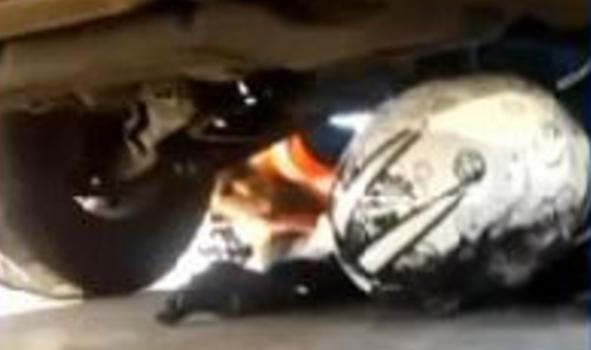 A motorcyclist was rescued after being trapped under a pickup truck in Corona, CA, May 1, 2015. CBS Los Angeles tracked down the man who shot the video. “I walk up to the guy, I put one knee down, I can see he’s kind of groggy, everybody gets out, we’re trying to figure out how to help him out, do we lift the car up, do we get jacks?” said Byron Holeman, one of many who came to aid the cyclist. According to witnesses and Corona Fire Department Spokesman John DeYoe, the motorcyclist was trapped and drug under the red Ford F-150 truck at freeway speeds. Another witness and rescuer included a local firefighter, Andrew Hubbard, who got a jack and was able to help lift the truck off him with the help of some Good Samaritans. Incredibly, the man was pulled free and hospitalized with only minor abrasions, DeYoe said. Holeman said once paramedics were called, he started recording the rescue scene, which he then posted to Facebook. As of Memorial Day May 25th, the viral Facebook video had been viewed more than 7,226,000 times. Amazingly, the man escaped the ordeal in Riverside County with only minor injuries, largely thanks to his protective gear. 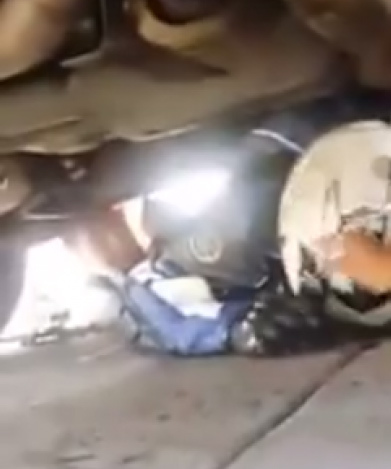 Screenshots from a video showing the rescue of a motorcyclist by a group of concerned citizens. Credit: Byron Holeman. An ambulance arrived on the scene a short time later. The man, who was in full protective gear, suffered only minor injuries, but was taken to a local trauma center as a precaution. This story underscores the importance of staying alert while driving, and being extra careful to watch out for Motorcyclists. Thanks to the Good Samaritans and the Motorcyclist’s protective equipment for the positive conclusion to this serious event. Are you looking for a Personal Injury Lawyer to help you recover from an accident? Join the GoLaw.com Online Legal Network to find an Accident Injury Attorney near you! Get common sense legal tips by reading our Monthly BLOGs and Newsletters. Watch Videos and Read Articles about the Law, Stay in touch via our Online Social Networks like Facebook / Twitter, and Contact Us when you are ready to get help. In addition to referring Attorneys and Lawyers near you, GoLaw.com is your online network for Doctors, Chiropractors, Auto Body Repair Shops, and more! Get a FREE LEGAL CONSULTATION by clicking http://GoLaw.com or Call 530-674-1440 Today! Have you been injured by a defective product? GoLaw.com is here to hep you find an Personal Injury Lawyer near you. Read our Products Liability Articles to get more information. If you have any questions, call 530-674-1440 to get a Free Legal Consultation. Products liability law covers personal injury and property damage that occurs when a defective product is used. A product is defective if its design makes it dangerous, if it was improperly manufactured or if the manufacturer failed to warn of the product’s dangers. You may be able to recover damages if you are injured while using a defective product. There are three theories of products liability: strict liability, negligence, and breach of warranty. This article covers a manufacturer’s liability for breach of warranty. Courts award damages to pay back a person for loss or harm resulting from injuries caused by a defective product. The trier of fact (the jury in a jury trial or the judge in a bench trial) decides the amount of damages. The trier of fact has broad discretion in setting the amount of damages. The following are some of the factors considered in making an award: the injury, the need for future treatment, any disability, pain and suffering, age, occupation, and pre-injury health. A person’s life expectancy is also considered if the injury is permanent.